The Scout 2 Lift features an adjustable height seat pole, upgraded electronics, and a higher weight capacity. 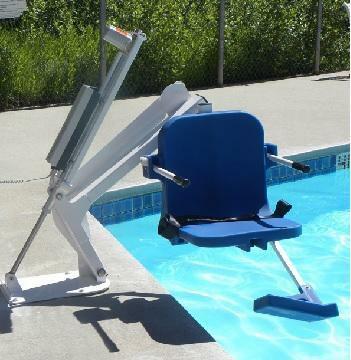 Utilize the optional pull-out leg rest for partially raised pools and spas. The updated base accommodates many existing anchors and a variety of different applications. The Pro Pool Lift is ideal for facilities with limited deck space as the unique design minimizes the amount of required space needed for installation. Now standard with an adjustable seat pole, this will allow you to adjust the seat from 18 inches up to 23 inches making lateral transfers from higher wheelchairs easier. Several versions are available, including our deep draft, reverse, and extended base configurations. The Pro Pool is constructed from stainless steel with a protective powder coat finish and features a 450 pound weight capacity. The Titan 600 lift provides the highest lifting capability of any standard pool lift on the market with a 600 pound weight capacity. 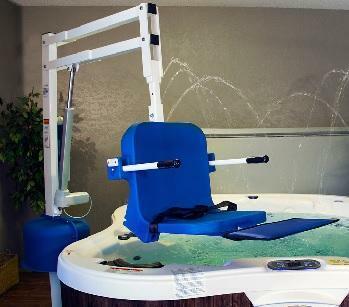 The unique, heavy duty design and anchoring system gives all patients and individuals the ability to enjoy the benefits of aquatic exercise, therapy, and play! 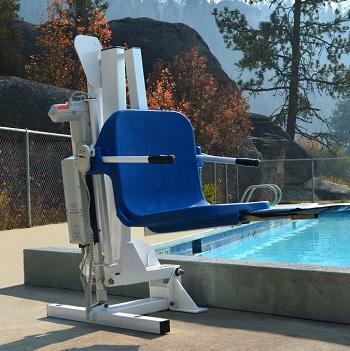 The Patriot Lift is the only completely portable aquatic lift that is independently verified to meet ADA guidelines. 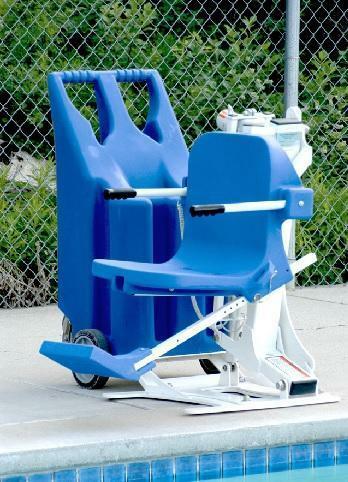 When deployed and ready for use, the Patriot Lift features a specifically designed seat allowing for easy lateral transfers from most wheelchairs. This gives full freedom of access to the individual. The Patriot maintains a 375 pound weight capacity. The Ambassador features an additional 10 inches of reach allowing clearance for wide gutters and spa benches. 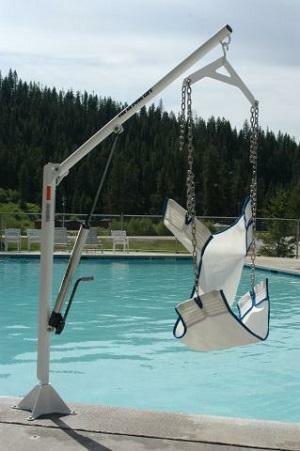 This extended reach can also clear a curb or pool wall, making this lift ideal for raised perimeter pools and spas. Highlights of the Ambassador include a 350 pound weight capacity, extended reach, higher seat for easier wheelchair transfers and an increased setback of up to 38 inches. The Ambassador now comes standard as a deep draft lift, allowing for a wider variety of pool applications. 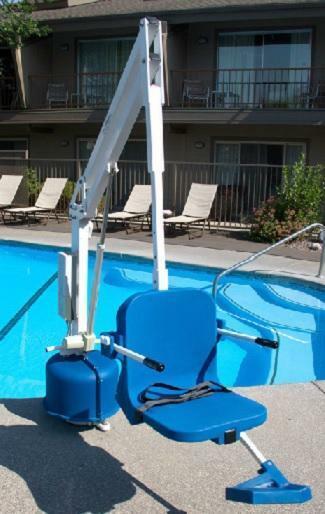 The Ranger Lift is an economical, third party verified ADA compliant lift that upholds Aqua Creek’s standards for durability and reliability. The Ranger features a 350 pound weight capacity while maintaining a sleek, low profile design. 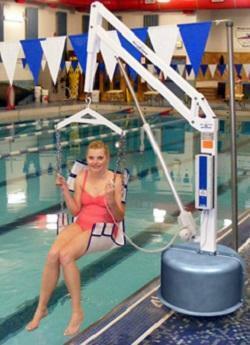 This lift is ideal for use on smaller hotel and motel pools. It is also a great choice for backyard pool enthusiasts who enjoy their independence. The EZ Lift series provides an economical alternative for residential pools and spas. 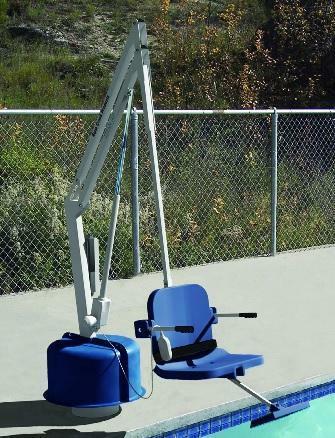 The EZ and Power EZ lifts provide easy access to above ground pools and spas. Both lifts are portable for storage and/or relocation to another dock or pool area. All EZ lifts come with a 400 pound weight capacity and stainless steel construction with a durable powder coat finish to ensure long life and corrosion resistance. These lifts also work great as a dock to boat access lift! The Revolution Lift provides the ability to service both above and in ground pools & spas. This extremely versatile lift accommodates up to 500 pounds and the variety of accessories available make the Revolution lift ideal for hospital and rehabilitation facilities. Available options include Gurney attachement, Wheelchair Picker, Sling Seat, & Spineboard attachment. 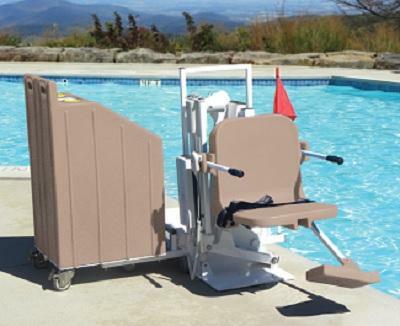 The Spa Lift Elite is a fully powered ADA compliant lift designed especially to provide access to elevated pools and spas. Pair it up with a swim spa and enjoy the benefits of aquatic exercise, improved health, and increased independence. The Elite offers easy push button controls and 360 degrees of rotation. The Spa Lift Elite is constructed of quality stainless steel and coated with a durable powder coat finish. Whether relaxation, rehabilitation, or socialization is your goal, the Spa Lift Elite is the solution to stress-free access to your personal backyard or commercial spa. 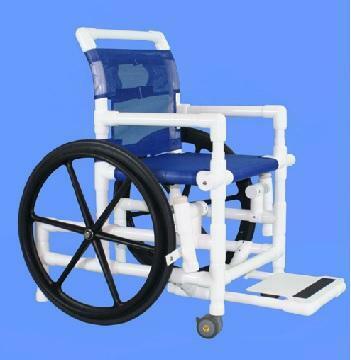 Aquatic stainless steel wheelchairs are collapsible for easy storage. Flip-up arms make for easy transfers. Upholstery is mildew resistant mesh suitable for daily use in pool environments. 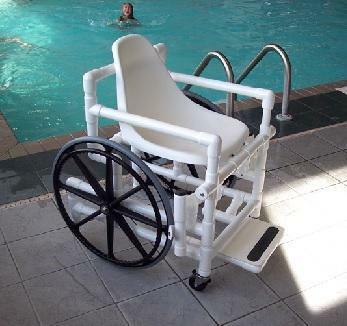 These Pool Access Chairs are an ideal solution for swimming pools with ramps or zero depth entries. These access chairs are constructed from medical grade PVC and feature an anti-tip design with non-rusting parts made of stainless steel. 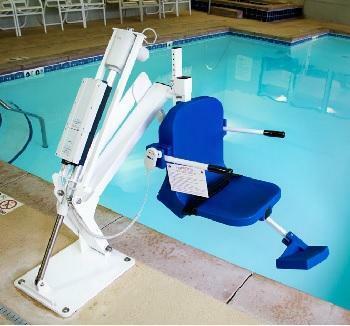 Made to withstand harsh environments, the Pool Access Chairs are great for use in showers, locker rooms and pools environments. Chairs ships with some assembly required.